You know the tale of the little girl with a curl in the middle of her forehead? Well, my guide dog Uska’s a bit like that. I only say a bit because when he's good, he is very, very good. He does however, have his moments. Oh, I have mine too. When it comes to being blind, I'm not very good at it and Uska has to cope with that. I guess some days we drive each other nuts, which is hardly surprising because we truly are a 24/7 partnership. Mind you, I do love the bones of him and not just because he's totally changed my life. Since I first got him, I've been wondering what is really going on in that head of his, especially when he's working with me in supermarkets, or at parties, or on trains and even in hospital casualty wards. During the early months, he was the only dog I knew who could make his harness look rakish, like a lovable rascal in an old Hollywood movie. If he'd spent as much time learning to work with me, as he spent on artfully dodging his way to any dropped chips, he'd have been Guide Dog of the Year. As it was, he managed to guide me down the aisle and a rock sliding mountain. He played paramedic for a day and stayed right by my side as my health got worse and worse. All this before he was 3 years old. 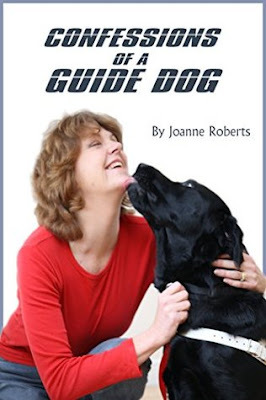 Confessions of a Guide Dog is a brilliant insight into life with a guide dog - and it's from his perspective! Or pawspective. No? Alright then... in all seriousness, this book is inspiring, humorous and full of raw honesty. It was such an interesting read and made me think about things I'd never properly given the time of day. Even better, this book was written for a good cause. Donate by post: cheques should be made out to 'Guide Dogs' and posted to 'Uska Appeal, Guide Dogs, Hillfields, Reading Road, Burghfield Common, Reading, RG7 3YG'. Donate by phone: Call 0870 240 6993 and say that you want to donate to the Uska Appeal. Donate online: via the website. It's a brilliant book, and seeing how much of a difference Uska made to Roberts' life was completely heartwarming. It's not much, but I wanted to highlight the charity aspect. It's a great cause, and a great book. He's a household name... without a home. Jake is an actor, a household name thanks to his role on the UK's most popular soap. But his character went upstairs to his bedroom six months ago and never came down again, and now Jake is facing an uncertain future. Add to that his dad's anger issues, the family's precarious finances and the demands of a severely autistic brother; Jake's home feels like a powder keg waiting to explode. It's easier to spend nights on friends' sofas and futons, but what happens when you feel like a cuckoo in every nest? It's that time of year again where we're treated to a new book by one of my favourite authors, Keren David! Her latest novel, Cuckoo, is entirely made up of transcripts and comments from YouTube videos filmed by Jake, our protagonist. He was a member of the nation's most-loved family in the nation's most-loved TV soap, until the show was cancelled for reasons that aren't immediately obvious. You'll probably either love or hate the format. Personally, I think it's edgy, original, and ensures the pacing is spot-on. The addition of YouTube comments means minor characters get to have their say, which was really interesting - who was telling the truth about why the show went off air? I also love that it shows a side of acting that most people don't consider. Someone might be on TV every night but that doesn't mean they're rich... it's unstable and unpredictable. As with all of David's books, I absolutely recommend this. 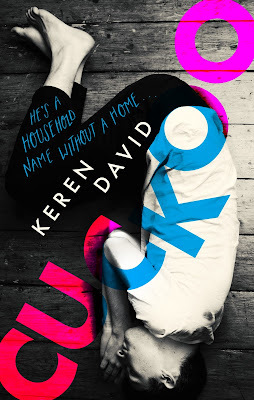 Like the idea of Keren David's book but have not read her other books. This book sounds so interesting! The format is definitely unique. I would really like to give this novel a try sometime soon. Great review Amber!